Nicky can help your church outreach program by providing a unique and powerful event – perfect for inviting friends. 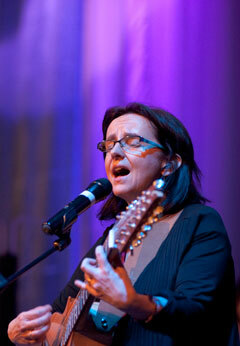 It is a special night of great music, storytelling and skilfully introducing people to Jesus. It starts with humour, songs and stories of life and faith, and moves through the evening to the travel narrative in Luke's Gospel as he is on His way to Jerusalem. He meets the little children and the rich young ruler, and tells the story of the tax collector and religious leader of the day praying in the temple. The threads all come together in a moving question – what will YOU make of Jesus? Nicky invites the audience to find out more, and challenges people to ask their friends about Jesus, to come to Alpha or just come to church... whatever further outreach opportunities your church is hosting. Typically what happens is a church will invite Nicky to come and do a Nicky gig. The organisers then do up their hall to look like a café; candles, mood lighting, small tables with chairs around etc. Then people from the church invite their neighbours, friends and family to come and hear a concert. The gig starts with Nicky singing songs about life and having fun with the audience. Her patter between songs is humorous, enjoyable and designed to put the listener at ease. Gradually, through song and patter, Nicky tells her story of how she came to be a "card carrying Jesus follower" when she was not born into a religious family. After about 35 mins there is a break for supper. People chat and enjoy coffee and food before the second half. Nicky reconnects with the audience with some fairly outrageous blues (with audience backing vocals) and she then begins a bracket of songs which outline some events and stories from the life of Jesus. Woven through the material is the theme that God the creator wants us to know Him and have our universe revolve around Him. The night finishes with an encouragement to really check Him out more with friends, and to stay and talk and have more supper. It is a great way to share your faith with those who are checking out spiritual stuff, yet may not want to come to church or who are not that interested in hearing a talk about God. The performances are very high quality entertainment. Here are some quotes from happy punters! "not for a long, long time have I heard such jargon free evangelism!" Nicky usually charges $300-$400 for her gigs. If she has to provide her own sound gear and operator there will be additional costs. If your church has very good sound gear with (foldback and some reverb capability if needed) ,and can provide a very experienced sound person to operate it then a cheaper deal can be negotiated. For entire weekends away (either in Melbourne or interstate) an appropriate fee will negotiated. Most churches cover costs by selling tickets – this not only covers costs but helps make it clear to people invited that this gig is of a professional standard. We do not want costs to be prohibitive. We can negotiate what is affordable for you. Please contact Nicky for more details.